Coach's Corner - "Ice Bowl" GB Packers multi signed/custom mounted 20x24 canvas litho print! Go Back to Lot List "Ice Bowl" GB Packers multi signed/custom mounted 20x24 canvas litho print! This fascinating 1967 themed NFL work is on canvas, mounted to a frame backing, and measuring 20x24 in size, and shows the Bart Starr QB Sneak scene in full color. 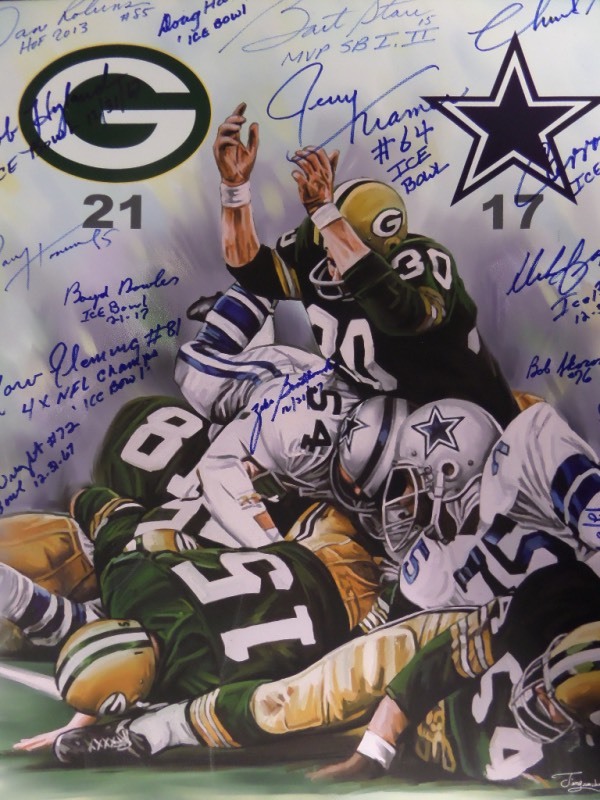 It comes blue sharpie signed by 15 members of the championship squad and includes stars like Bart Starr, Willie Davis, Dave Robinson, Marv Fleming, Jerry Kramer, Paul Hornung, and more. It grades a 9 or better all over, value is $2000.00 on this Lambeau Field beauty, and we're starting the bidding at a mere 1% of that!! !